Thai Politics In Chaos: Delayed Election Results And Charges Of Cheating The Pheu Thai party — which was ousted in 2014, shortly before a military coup — wants to form a coalition government. But so does the ruling junta's party. Thailand's major parties are vying to control its government, after mixed tallies in early election results. Here, Sudarat Keyuraphan, the Pheu Thai party's prime minister candidate, is seen after a news conference in Bangkok Monday. The Pheu Thai party — which was ousted in 2014, shortly before the military seized power in a coup — says it's looking to form a coalition on the strength of winning more than 135 constituency seats out of 350 total. That's compared to the junta-backed Phalang Pracharat's nearly 100 seats. "A political newcomer, the anti-junta Future Forward Party finished strongly as well," NPR's Michael Sullivan reports for our Newscast unit. "The Election Commission says it will announce results for 150 party list seats on Friday. Pheu Thai's leadership says it will try to form a coalition government that could include Future Forward and others. But the military-backed party will try, too." The results, while still in flux, could leave the junta in power despite not having a majority coalition in the lower house. As Sullivan reports, Prayuth Chan-ocha the Thai coup-leader-turned prime minister, could easily keep his job, in part because the junta appoints the entire Senate — bringing 250 votes to bear in selecting the prime minister. Thailand's Election Commission released the latest unofficial tally Monday afternoon, following repeated delays and confusion over the results. The agency says an official tally won't emerge until early May, according to the Bangkok Post. Sudarat Keyuraphan, Pheu Thai's prime minister candidate, said on Monday that her party is working to form a governing coalition. "As we have said before, the party with the most seats is the one that has received the confidence from the people to set up the government," she said, according to the Associated Press. Thanathorn Juangroongruangkit, whose Future Forward finished in third place, said on Monday he's not looking to be prime minister at this time. Instead, he reiterated his party's goals, such as revising the constitution to make it more democratic, and ending Thailand's cycle of military coups. The outcome's lingering uncertainty, paired with earlier changes to Thailand's election process, prompted former Prime Minister Thaksin Shinawatra to accuse the military of manipulating the vote and putting Thailand's democracy at risk. "The junta appointed the election commission and has interfered with the work of what are supposed to be independent agencies and institutions," Shinawatra wrote in an editorial for The New York Times, adding that the junta had also revised the Thai constitution to weaken its rivals. 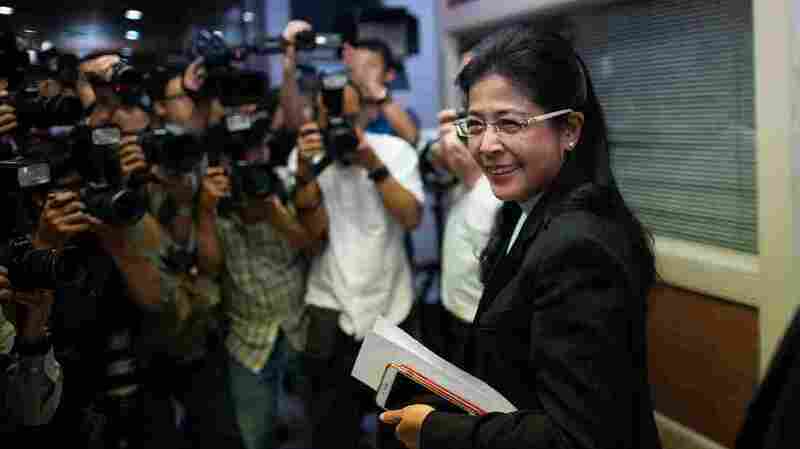 Shinawatra was deposed in a military-led coup in 2006. Sunday's general election was Thailands's first since his sister, Yingluck Shinawatra, was ousted in 2014.